Advertise on Australia's #1 stock market forum. 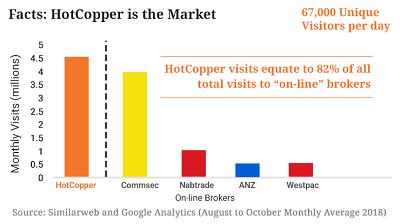 HotCopper is a highly engaged community with over 300,000 registered members, 52m pageviews and over 67,000 unique visitors per day. 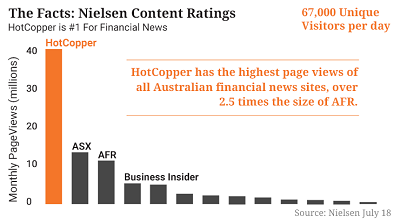 HotCopper is Australia’s largest ASX discussion forum. 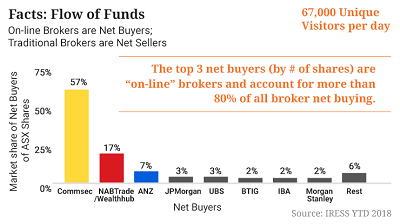 Our users are active investors who visit the site to discuss topics including ASX-listed companies, investing and politics. On average, each visitor spends 27 minutes a day on the site. HotCopper offers a unique opportunity for advertisers to connect with a financially affluent audience. 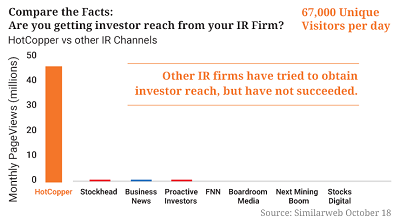 Our members continually show a great interest for public company news, research reports and investment opportunities. We have also recently introduced a new product, Corporate Spotlight, specifically for ASX-listed companies looking to reach a existing and potential shareholders. Please click here to contact us to find out more.